Thursday, April 18, 8 pm to Friday, April 19, 7 am. "Stay with me . 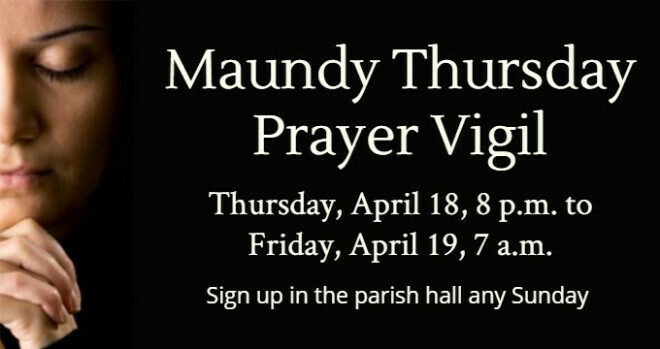 . . watch and pray"
Parishioners are invited to sign up to spend an hour in prayer in the church, remembering how Jesus asked his disciples to keep watch while he struggled with his destiny in the Garden of Gethsemane. We need at least two people for each hour of the vigil; more are welcome. A sign-up sheet is available in the parish hall. The church doors will be locked throughout the night to provide security. For more information, contact Vigil Coordinator Holly Swartz at or 542-1978 or Rev. Gretchen in the church office, .